Using my biscuit recipe make it up to the point just before adding in the milk, set aside. In a small skillet, melt the butter and toss in the onions and sauté for a minute or two to soften, add in the 2 eggs and gently stir around to begin scrambling. Remove the eggs when they just begin to set from the heat. To the biscuit mixture add in the bacon, ham, eggs & onions and toss with a fork to combine it all together in the biscuit mixture. Add in the cheese and again, combine well. Slowly begin adding in the buttermilk and using the fork pull it all together to form a soft (it will be somewhat sticky) dough. Grease an iron skillet or baking sheet and preheat the oven to 425 degrees. Using well floured hands pinch off a portion of the biscuit dough and roll in your hands and then place in the pan and lightly flatten the top. Continue with remaining dough. Bake for 15-17 minutes, moving from bottom rack of oven to top when the bottom has begun to brown. 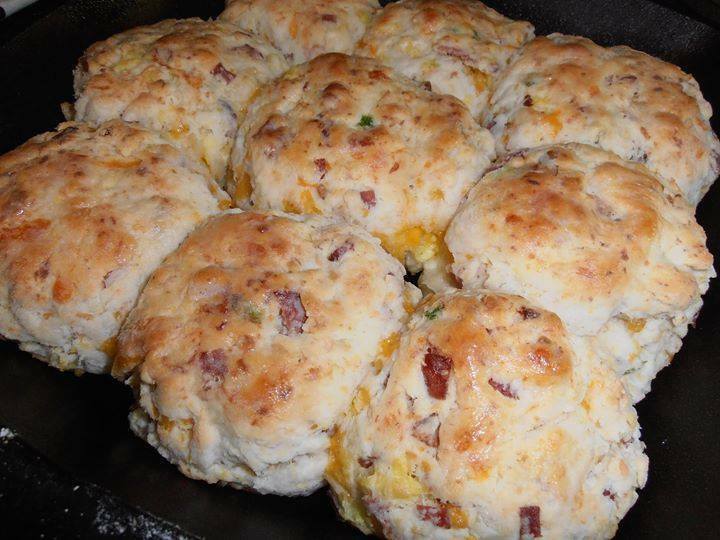 Remove and rub the tops of the biscuits with butter.